ROSES: Preparing a "Winters Nap"
As hard as it is to do, in cold climates we need to put our roses to bed for a nice winters nap. If we take a little time to do things right now, we will see them burst forth in beautiful bloom come spring. There are many different methods used by cold climate Rosarians like me, so I will just go over some ways that I take care of my roses for the winter. Once a good hard frost has hit and the ground has become at least somewhat frozen, I mound up garden soils around each rosebush in some of my rose beds. The mound is approximately 6 inches in height. If I do not have some extra garden soil saved up I buy some bagged garden soil at a local garden center for this, well before I actually need it, of course. I make sure not to buy any garden soil that has fertilizer added to it as that is not needed or wanted for this winter mounding use. Once I have formed the mound of garden soil around each bush I water it lightly to hold it in place, then a nice layer of shredded cedar mulch is placed over the top of the mounds. I find that the mulch helps to hold the mound in place. I water the completed mounds lightly again to help settle it in place. When I pull back the mounding and mulch in the spring, the mixture (with some added compost) makes for a great amendment to the soils around the rosebushes. I need to step back just a bit here though. Before I actually do the mounding, I will apply two or three tablespoons of super phosphate around the base of each bush and work it into the soils as best I can. The little dose of super phosphate helps keep the roots strong through the winter. The application of a good fungicide back in late fall is highly recommended as well, it simply helps knock down any fungus problems that may try to overwinter and gain an upper hand on the rosebushes. Some of my roses are planted in gravel-mulched beds. In those areas, I have done two different forms of mounding for the winter protection. (I give all of these roses the same two or three tablespoons of super phosphate as well.) One way I mound my roses in the gravel beds is to form a gravel mound around each rose with some of the existing surrounding gravel. Since it is so simple, I use this method on nearly all of them. 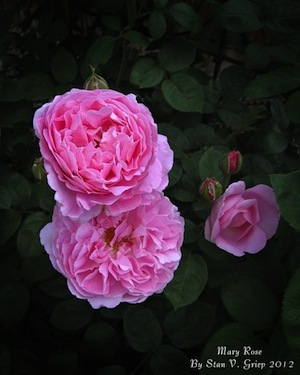 However, some roses are a bit more winter tender and need a little different protection. Since I do not want to pile garden soil on top of the gravel mulch, I put down a 20 to 22-inch diameter circle-cut piece of landscaping fabric at the base of each rose. The landscape fabric has been cut at one side to form a slit as well as a hole cut in the middle to allow placement of the bush into the center of the fabric circle. Once the landscape fabric circle piece has been fitted around the base of the rosebush, I make sure to overlap the cut area to seal it into a complete fabric circle without gaps, except at the very base of the rosebush. I form the 6-inch garden soils mound on top of the fabric circle and up around the rosebush. After completing the soils mounding I apply the same nice layer of shredded cedar mulch to help hold things in place, watering both the soils and completed mounds very lightly. 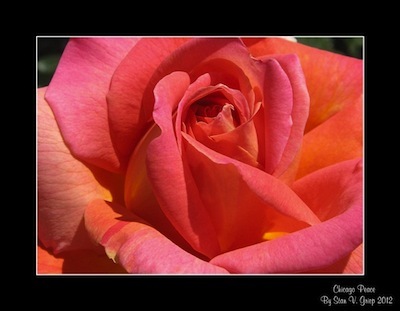 A plastic rose collar can be placed on top of the fabric circle as well and then filled with garden soils and/or mulch, thus protecting the rose and holding the mounding well in place. I water these mounds a little also. In spring when it is time to pull back the mounding protection I use a garden shovel and place the soils and mulch mixtures in the various areas into my wheel barrel where it is all mixed with some nice compost. The gravel mulch is pulled back away from each of the rosebushes, some of the amendment mix from the wheel barrel is worked into the soils around each rosebush, and a bowl shape created with the existing and newly placed soils. At this time the spring feeding is also worked into the soils and the gravel, in the gravel mulched areas, moved back into place and everything watered in well. My other rose bed areas get the soils mix and then are mulched again with some new mulch and watered in well. The landscape fabric works great to stop the soils from getting down into the gravel and discoloring it or basically just making a mess of the surrounding gravel mulch. I use new landscape fabric circles each year where I use this method. The landscape fabric is purchased in a large roll. I outline and cut out the fabric circles myself well prior to actual need. It is very important to note, the protection referred to within this article is actually to keep the rose cold once the cold weather has set in. That way the warmth of several days in the winter does not start the rosebush growing again only to be zapped by the freezing cold temps when they return. That fluctuation is what can kill the rosebushes. It is very important to keep them in their cold weather dormant state throughout their “Winters Nap”.